Another Day…. 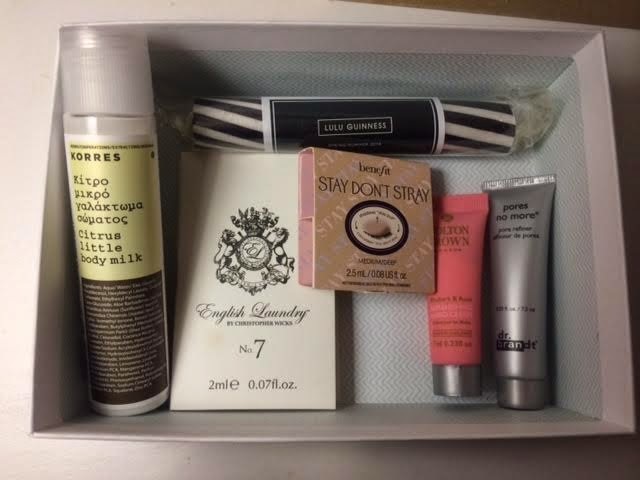 Another Beauty Box! Ive titled this week’s post amusingly as ‘Another Day…Another Beauty box’, due to the fact that I have now accumulated so many beauty products over the past few months that my beauty/ makeup area is starting to resemble a mini Selfridges! I received my Birchbox subscription as a Christmas present last year and have not been disappointed. The products have been of a high quality and most boxes have had a full size product in it that I would definitely go an buy myself. March’s beauty box had a big PR build up with the collaboration of Lulu Guinness and Birchbox, therefore you could see what I was disappointed to find that the only item in the box that was actually Lulu Guinness was in fact a piece of Rock! The Rock aside I would still recommend Birchbox if you want to try all the latest beauty products on the market or before they launch. Medium to Dark – a light weight formula that is applied prior to putting on any concealer. What’s the point of this you say? Well the light weigh formula once dry is meant to ensure that your under eye concealer and eyeshadow stay put all day and night! A silky serum to be applied to skin in the morning and thoughout the day to absorb shine and Matt skin. I will keep you posted! A lovely lightweight bodymilk that is a combination of almond oil, aloe, shea butter and loads of vitamins for extra goodness. Intensive hand cream, with white truffle and rose extract. … and not forgetting the Lulu Guinness Rock! If you have a birthday, life event coming up, or you just fancy treating yourself I would definatly ask for a Birchbox Subscription. For £10 a month plus shipping its a great gift that just keeps on giving! p.s …Shhh! Watch this space! Mrs J does Blogger Fashion Week!